Cut out the middle man and subscribe by email to get WGD updates direct to your inbox. Not intent on being an online ‘power house’, it now seems that Google has its sights on becoming one in a more literal sense. In what seems a very perceptive move, it’s been reported that Google have applied to create a subsidiary company in the US (imaginatively called ‘Google Energy‘) with which they can start trading energy on the open market. In entering this sector, it seems they are taking the future insecurity of energy supply into their own hands. Some commentators are sceptical that Google Energy is a business move purely for the money, yet Google insist they are doing it for the more philanthropic reason of reaching carbon neutrality. Producing their own energy at their Californian HQ, this move will enable them to trade the excess created and pump it back into the grid. However, future investment in the renewable energy sector clearly makes keen business sense. In all honesty I’ve been meaning to write this post for a few weeks and was initially going to discuss the role of smart meters and the UK government’s plans to roll these out by 2020. Like the previous post about boilers, smart meter systems are hardly the most glamorous of devices to discuss, so Google’s very recent movements into the energy sector has spiced the whole affair up a bit. This is especially because their innovative technologies make the UK utility companies plans look prehistoric even before the meter fitters have chucked their tools in the back of the van. You’ve probably heard or seen in the UK media about how ‘smart meters’ are the future. The idea behind them is that in keeping tabs on our daily usage of Electricity or gas, we can curb how much we use and determine when we’re being wasteful. Our currently dubbed ‘dumb meters’ which require that quarterly annoyance of letting in the meter reader (or more often than not when our energy provider spuriously estimate your bill) means that as consumers we’re often paying over the odds for the energy we actually use. Imagine if they applied the same process to a contracted mobile phone – no itemised bill but instead a rough guess on how much you’ve been yapping on the phone for the past 3 months. That doesn’t seem to make any sense does it? Here’s a radio feature created by my colleague Jim Turner just before Christmas on this very subject . So these so-called ‘smart meters‘ are meant to be the answer, but may not actually be that ‘smart’. 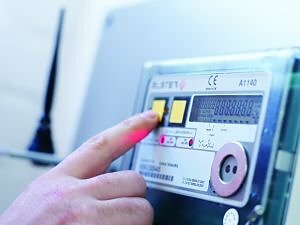 They will cost between £85 -£100 for each household and work by sending usage data directly to the power company each day. However the technology they contain is not that up to date at all. They work by sending through how much energy you’ve used by SMS text message to your Utility Company who then use the data to create an itemised monthly bill. This mobile phone technology has been around for almost twenty years and for this reason the Energy sector in UK are having second thoughts on a nationwide meter upgrade. They fear that by the time each and every home has been visited the smart meters will have become obsolete. This is some way off for every customer in Wales though. Currently the only company who offer this service are first:utility and you do need a smart meter installed for it to work. Being more energy-efficient is obviously inextricably linked to freeing up some more of our incomes. In years to come, if winters look set to be as harsh as this one, then we’re certainly going to have to trim on energy usage to avoid bankrupting ourselves to keep warm and watch the telly. For more tips on how you could save, check out Energy Circle’s 10 big ideas for home energy efficiency in 2010.